It’s day four of Drink Week! Today’s topic is the fruit shrub. These are a concentrated fruit syrup, spiked with vinegar, to give it an appealing sweet/tart flavor profile. They definitely need dilution, so top them with a bit of sparkling water (and make sure to click over and enter the Sodastream giveaway). Make sure to check out the previous two Drink Week posts, Black Raspberry Syrup, Cherry Bounce and Other Boozy Infusions and No-Cook Sour Cherry Syrup. I started hearing about fruit shrubs a lot last summer. A bartender, upon hearing that I was a canner, mentioned that he made his own. I started seeing them discussed on various cooking blogs. And I spotted the bottled version that Pennsylvania growers Tait Farm makes and bottles. When my friend Albert mentioned them again recently, I realized it was time for me to give shrubs a try. The combination of fruit, sweetener and vinegar that makes up a shrub goes back to colonial days, when they were a popular way to preserve and enjoy the fleeting bounty of summer. Now, I realize that some of you might be initially turned off by the idea of drinking vinegar, but truly, shrubs are worth your consideration. You know how satisfying it can be to balance the sweetness of jam with a bit of lemon juice? Well, shrubs work on a similar principle, while also managing to enhance the flavor of the fruit. The tonic that results from the combination of fruit juice, sugar and vinegar is a delicious miracle. 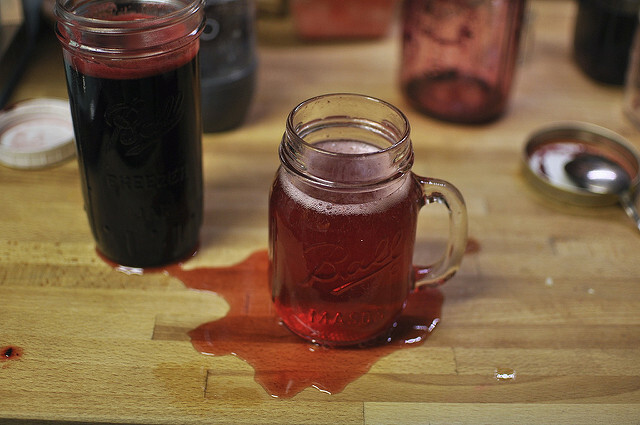 In doing my shrub research, I settled upon the cold brewing technique outlined in this post over on the Drinks section of Serious Eats (penned by cocktail expert Michael Dietsch). I liked it because it was dead easy and meant that I didn’t have to turn my stove on again (always a plus in late June in Philadelphia). 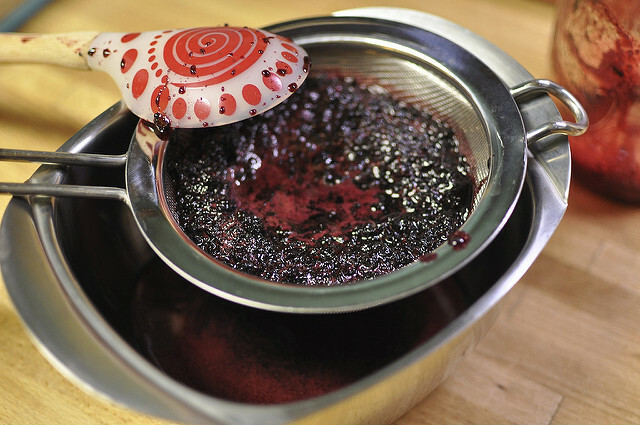 In a wide-mouth quart jar, I combined a rough cup of black raspberries with a cup of cane sugar and smashed the heck out of them with my handy muddler. Once I had a messy mash, on went a lid and the jar headed for the fridge to hang out for a bit. Two days later, I pulled the jar out. With most normal fruit, the sugar will have pulled a great deal of the juice out of the fruit. These black raspberries were thicker and stickier than many berries I’ve seen and so needed a little bit of additional water to get well and truly syrupy. I added all of a 1/2 cup to really get things going. When I was ready to make the shrub, I strained the seeds and pulp from the syrup, really working the solids to ensure that I was squeezing every last bit of juicy goodness from them. This yielded about 1 1/2 cups of syrup. To the syrup, I added 1 cup of vinegar. The instructions on Serious Eats call for apple cider or red wine vinegar. I actually used some of the blackberry vinegar I made with seeds from a jam making session last summer, but I realize that not everyone has a cache of blackberry vinegar. Follow Michael’s advice and use the apple cider or red wine vinegar. Stir the vinegar into the syrup and stash in the fridge. It should taste good right away, but the flavors will continue to deepen and evolve, so try and let it hang out a little while. 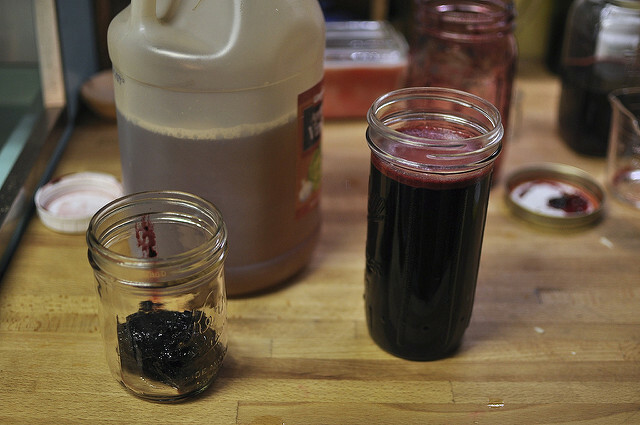 Make sure to save those leftover black raspberry seeds and start a batch of infused vinegar. Your future self will thank you! Oh, and pour the sparkling water carefully when there’s some shrub in the glass. It makes those bubbles fizz and explode (as you can see in the picture above). I’ve never had a shrub, but suspect that the flavor is not unlike kombucha. I like to use up jam pulp (and skimmed foam) to flavor it when I bottle. I’ve been increasingly fond of even stronger vinegar tastes, and can wait to try this with some Bragg’s style vinegar! I have a jar of strawberry and one of rhubarb working magic in the fridge right now! I suspect I’ll have to add some water to the rhubarb, I’ve had it sitting for 5 days now, it’s deepening in colour nicely. I see some cocktail parties in my future! I came upon a sample of Tait Farm’s Raspberry Shurb way back in the early 1990’s when the Book and the Cook events were still happening in Philly and they had a table set up to show off their goods! I was blown away by the stuff and bought two bottles! Never thought to make it myself, but this is awesome and I have got to seek out some berries! The shrub was great in salad dressings, sauces, over ice cream and as a refreshing drink in the heat of the summer! Thanks for bringing back the memories and passing along a new idea for berries! This sounds so interesting! Thanks for sharing yet another drink! Love the drink idea! But I had to tell you about my … your peach jam recipe. I added about 2 tablespoons Lavender flowers and steeped them in the jam. OHHH! so good. You must try it. Just a simple 3 minute touch that brings the whole thing to a new level. So good I can’t share any that I made! Thank you for your recipe. Ah, you beat me to it! 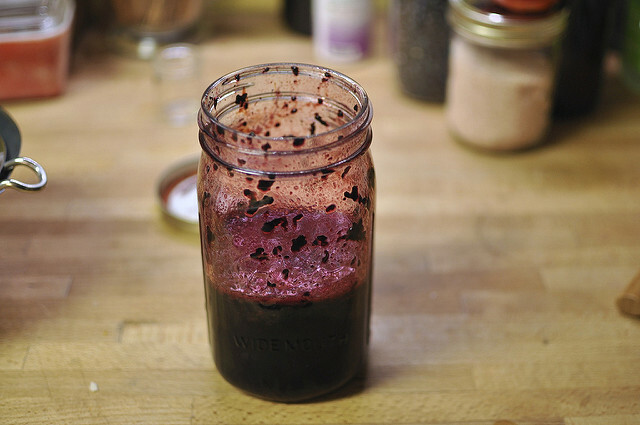 I’m planning on making some of this in a few weeks once our black raspberries get going full tilt! That’s funny you mention Tait Farm. They are right down the road from my house. I love their shrubs! They make great vinaigrette and are also a great addition to white wine. Love this! I just picked a bunch of wild black raspberries and now I have something to do with them! Yay! My boyfriend keeps a bottle of vinegar just for drinking. Straight up, no dilution. Just thought this was funny! I’ve got some blackberries in fridge right now: they’re bored silly trying to figure out what to do with themselves. I’m going to let them know about this post! By the way….there’s that tall straight sided Ball jar again! C’mon, I’m dying to know about it. Is it vintage? Some sort of specialty jar? Leslie, that’s the vintage 1 1/2 pints jar. They haven’t made them in years, which I think is a damned shame. It’s such a useful size and shape! Thanks for your reply, I’ll definitely be on the lookout! I bought a case of those 1.5 pint jars in my grocery store around the holidays a year ago. Mine have the fancy “basketweave” pattern on the outside, but other than that are identical to the one pictured. They are super fun for vinegars. Ask your local supermarket to special order them for you! Christyna, chances are that the jars you got are the 12 ounce quilted jelly jars. Ball doesn’t currently make the pint and a half size, so they’re not available for special order. Classico’s pizza sauce comes in 20.5 ounce jars that fit the regular mouth lids and bands. I suppose “technically” you are not supposed to use these for canning as they are not specifically made for the home canner, but I have never had a problem with breakage or spoilage with them. I buy a bunch when on sale since I get sauce AND a new jar! (I also save all Classico lids to cover opened jars of preserves, rather than dealing with 2 piece lids and bands…). Just thought i’d share! :). Looking forward to try some of your recipes with the black raspberries my girls and I just picked! My first thought as I dug through the boxes was, how old are these? The internet hasn’t been much help. Probably because I don’t really know what I’m looking for or how to look for it. Then I thought of you and wondered if you would be interested in helping me figure out if any of these are 1. valuable and 2. safe to use or 3. safe to sell. Most of them are Ball or Kerr jars, some of them look quite old (mid 1900’s perhaps). There is at least one Bernardin which looks brand new. Anyway, give me a shout if you are interested in helping a poor, overwhelmed country girl with mason jars running out her ears. Have you tried rhubarb and ginger shrub? It was a recipe a few months back in a vegetarian magazine I subscribe to. It is FANTASTIC. It tastes like the best ginger ale you have ever had, with a great rhubarb kick. It has to be cooked (rhubarb and water), then squeezed through cheesecloth, add the juice to the vinegar, sugar, and ginger, and whoooeee! It is a nice pink syrup, added to fizzy water it it better than store bought ginger ale. I really encourage folks to try a shrub. A friend brought a rhubarb, blueberry and ginger shrub over on the 4th of July. It was amazing – so zingy and refreshing! While I did buy black raspberries at the farmer’s market yesterday, we ended up eating most of them before we made it home. So I have a peach shrub in the fridge, I used 2 cups of chopped peaches and 2 cups of organic cane sugar. Mashed them up and they’re hanging out getting juicy. Boy, in a few weeks I’m going to have a zillion jars in the fridge! 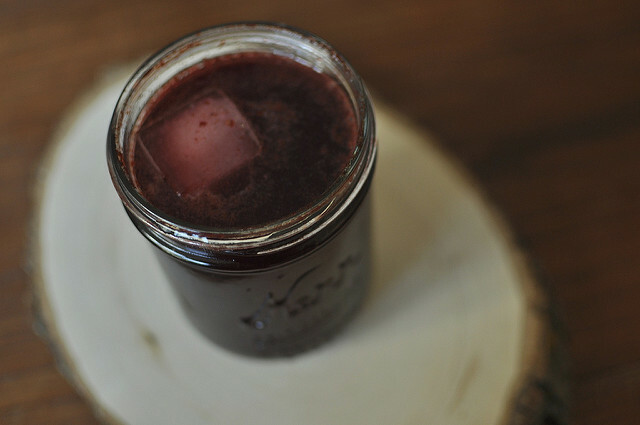 Rhubarb blueberry, rhubarb ginger… oh yum! So many good ideas in the comments! Something came out wrong in the finished product…. far too acidic. I think it is too much vinegar, or the wrong kind of vinegar…. I was almost out of balsamic so I used 1/4 of the vinegar as balsamic to use up the bottle. In retrospect that may have been a mistake. Would you make more syrup and add that in or just use less in the water? Andrea Reusing’s recent book “Cooking in the Moment” has some interesting drinks in it. One of them is a “Homeward Angel,” with 2 oz rye whiskey, a half ounce of vermouth, a dash of orange bitters, pickled sour cherries and a dash of the brine. The cherries are pickled primarily in vinegar and sugar, so the result is a bit like a cross between a manhattan and a shrub. I like the vinegar tang and I wonder what other drinks could be made with pickling brine. Lily, I’d probably just dilute it more. Most recommendations I’ve seen call for 1 part syrup to 4 parts water, though I recently bought some bottled shrub that recommended as little as 1 to 8, and my wife likes it at 1 to 16. Its very much a matter of taste. guidelines on starting a fruit vinegar from the leftover pulp and seeds? Natalie, just put them in a jar and cover them with vinegar (either distilled white or apple cider). Let them sit for a few weeks or months (really). Strain when it tastes good. Use any way you want. Loving the recipe for the shrub! I’d love to make the vinegar also with my leftover seeds and pulp, but my question is, can I still use the seeds and leftover pulp from the above recipe if it’s been macerating in sugar? I’ve never tried it, so I just don’t know. I’ve been enamored with fruit shrubs for a while now and Albert and I geek out about them plenty at the Farmstand, but the question of further preserving them keeps coming up. Given the amounts of vinegar and sugar involved, would you be able to water-process them and make them pantry stable? I’d love for you to weigh in, I’ve got more than a half dozen pints or so taking up valuable fridge space! You should definitely be able to water bath can them. Bring them to a boil, pour into hot jars and process in a boiling water bath for 10 minutes. Finally got to try my raspberry shrub tonight. Delicious (definitely vinegar tasting but delicious). Thank you for sharing such a delightful idea. Can I do this with red raspberries as well? Can you can this to store it on the shelf? 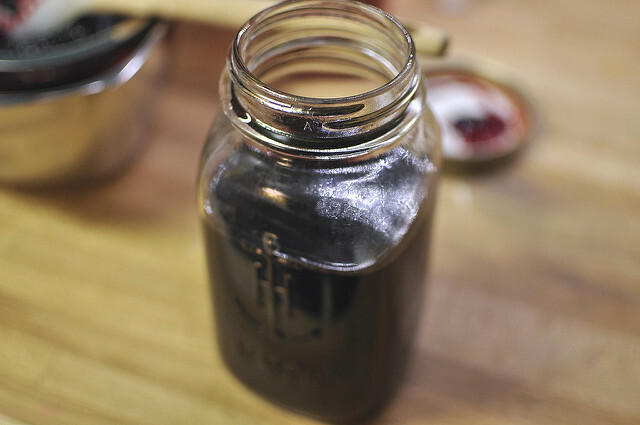 Can you share how you made your black berry vinegar from seeds? (what starter vinegar did you use? 1. Yes, you can do this with red raspberries. 2. You could can this for shelf stability, but heating a shrub can impact its flavor. However, if you want to go that way, bring the shrub up to a boil and then do ten minutes in a boiling water bath. 3. To make the blackberry vinegar, I simply put the seeds in a jar and covered them with apple cider vinegar. You could use white, but I like the sweetness of the apple cider slightly better. I’m loving this black raspberry shrub I’ve just finished! I used the leftover brine from your pickled strawberry recipe as my vinegar, it’s wonderful! Hi,i would like to preserve this out of the fridge.Can i canned it? Yes. Search for some of my other shrub recipes to find processing times. thank you so much for replying so quickly!!! I know it’s always best to use fresh fruit in season but can you make these using frozen fruit? I love shrubs and would like to make my own – even when it’s not full blown produce season.